“ I do believe in Kanban, it did help my daughter in school big time!
" 2 years ago, she used to bring her homework, put her agenda on her desk and start crying :) she didn’t know where and how to start. At school, they give them lot of tasks to perform every Thursday. They write them in their agenda, and they have to perform all of them by the next Friday (they have one week). Schools and teachers expects kids to manage their tasks by their own, but in reality, I see all parents around me managing the homework tasks for their kids. Some parents and kids are great working with the traditional agenda, but for my daughter, it was a big a challenge. One day she forgets her agenda at school, the other day she starts multiple tasks same day, another time she forgets that she didn’t finish a task etc. Both my husband and I are software engineers, my husband is a scrum master, he knew about agile mythologies and Kanban. My husband suggested to use Kanban as an alternative for her task management, because he knew that she was very visual, and Kanban will be perfect for her. I loved the idea; we started using Kanban as a physical board with stickers. I started developing the app , kids enjoyed the experience, because they participated, they asked for features (task becomes red when it is due next day, earn points when they finish a task etc…), they have chosen colors, pictures etc… They have been using it since March 2012, and they just love it! Even my 6 years old son is using it for his homework which I didn’t expect, thought he was too young. I realized that kids nowadays are born in a modern era, with Ipads, tablets, smartphones etc. They naturally love using devices, so why don’t get even my son a tablet for his homework and teach him managing as well! He loves earning points and practicing maths on KanPlan . It’s not just the tablet and the board, it’s the way they own their task that makes this whole deal worth a try. The Kanban is a minded approach, it teaches them visualize what they need to do , moving tasks around the board , making decision and getting things done. The app, was designed for them, it had to be easy and fun. It holds a neat look and feel and an easy way for the kids to add tasks drag them around the board and see the completion. I also added predefined tasks, that are quick to add and run on KanPlan . Something like practicing times table. Instead of my daughter entering manually a task for practicing her times table, she browses a selection of tasks (KanQuiz), picks the one she wants, and running it directly in KanPlan. It avoids me of writing some multiplications on paper to practice. It is integrated, and gives her a report at the end how fast she was and her score. I see KanQuiz as reusable tasks, that can be done several times by one kid, and are there for my next kid once they reach the KanQuiz grade level. I am also adding KanWord to the selection (tablet will speek to kids), to practice spelling and grammar soon. Anyway, my kids are 100% self-managed now, I am so proud of them, they come at home after school, they go directly to their desk where their tablets are, and enter their tasks and manage their work. My daughter went from being an average student who was unable to focus, was lost in her tasks to do, to an efficient and very organized student, now she always finishes a task before starting a new one and never forget a task to do. She was able to manage her tasks to practice exams for entering private schools. She did that using KanPlan by her own. She applied for 4 private schools, we were hoping to get 1, and she succeeded all of them! We were so proud of her! My daughters wish to bring their tablet at school and avoid the “agenda” step. Instead of writing their tasks in the agenda and enter them back again in KanPlan once at home, why not entering them directly to KanPlan in the class? Schools are too strict right now, they don’t want electronics in their classes. I am positive that it will change one day. I just hope that they will allow students to use different solutions for their task management, because the traditional agenda is not a solution that fits all students. I definitely see KanPlan as a solution for teachers/tutors who want to teach kids how to manage their tasks. I have few comments from some teachers who are waiting for the admin tool (we are working on it) that allows them to create KanTasks and assign them to their students. 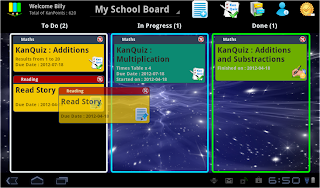 Students will automatically see their tasks in the TODO list! I would love to talk to more teachers/tutors to get more comments about how we can use KanPlan in a class environment that fits and embrace how teachers/tutors work. My challenge now is to continue improving KanPlan and keep it interesting and fun for all kids. Don’t hesitate to contact me for any comment, any feature request or change request ! Houda Hamdane the owner and developer of KanPlan . That's a really neat idea and a great way to leverage a child's naturally competitive spirit!